Many of the seamstresses that we employ to construct the reusable menstrual pad kits are women in their 40’s and 50’s. Due to age and a lack of adequate lighting in their homes, the visual skills that are required for the detailed work can be frustrating. 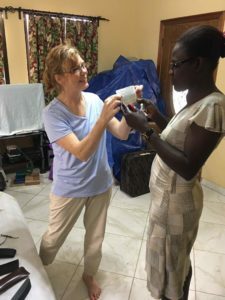 A recent volunteer to Haiti, Kris Dirks, brought reading glasses in different magnifications that were donated by Eye West Vision Clinic in Rogers, MN. The seamstresses were amazed that with the glasses they could read the letters on a small piece of paper held out in front of them. 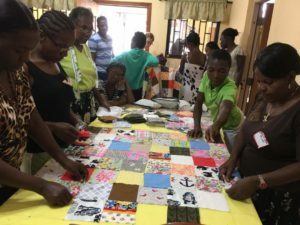 The seamstresses had asked for other projects that they could complete with the scraps of fabric that they create when making the menstrual pad kits. Kris and her daughter Laura designed small blankets that use 4 inch squares of cotton fabric quilted together for the top. The women enjoyed arranging the squares into different color patterns and then learning how to sew the squares together and attach a flannel backing. They plan on marketing the blankets to expectant mothers to use. This entry was posted in Uncategorized on January 29, 2018 by Leslee Jaeger.